Celebrating 10 years of making bodies sing! 10 years ago I left behind the graphic design desk in favour of helping people achieve greater wellbeing through bodywork. Since then I have also been teaching yoga and using these skills to recommend self-care for massage clients. I love this work and am extremely grateful for the flourishing of my practice since opening shop in 2008. I want to personally thank each of you for your patronage. I have not updated my entire list of fees in all this time and my rates have fallen significantly below standard for the services I offer. This was fine for building my practice, but it is time that I give myself a raise! Having let go of my public treatment space, I keep my overhead low by seeing clients at my cozy home space and with home visits. I am keeping my fees very competitive to reflect this. I am also continuing to offer a sliding scale for those in need (see below). 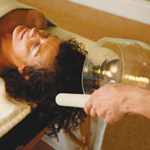 For a full-body Thai Massage, 90-minutes is required. This is already a shortened version of the 2-3 hour tradition as it is practiced in Thailand. However, I can offer a 1-hour session which will deal specifically with particular areas of concern as determined by our consultation. South of Eglinton Avenue to Lake Ontario; West of Broadview; East of Jane Street. I will travel further for an additional fee. I wish to keep self-care accessible by offering special rates for ARTISTS, MUSICIANS, FULL-TIME YOGA TEACHERS, FULL-TIME HOLISTIC PRACTITIONERS, STUDENTS, ODSP RECIPIENTS, SENIORS ON FIXED INCOME and the UNEMPLOYED. BOOK ONLINE! You may also book by email. 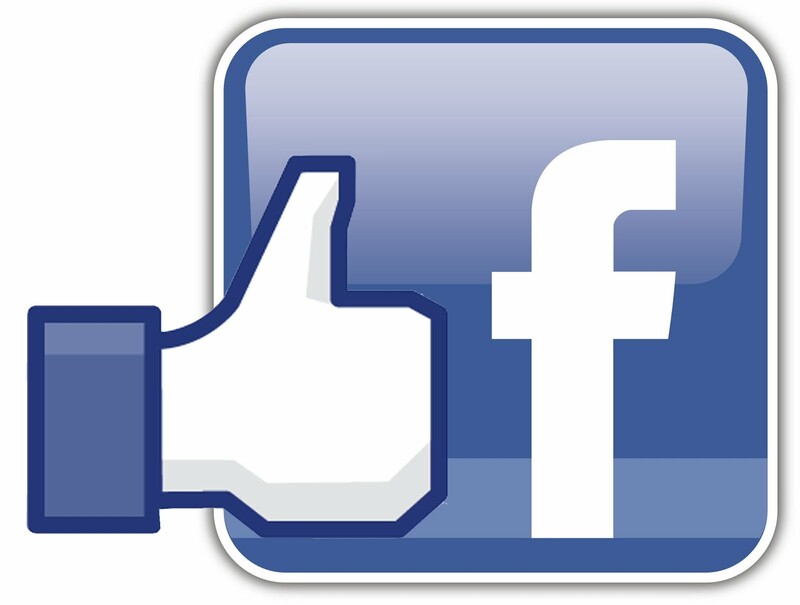 Facebook now allows reviews on business pages. If you like my services, please head here and comment. I’ll give you 10% off your next session! 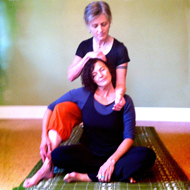 Intro to Thai Massage Workshop ~ registration open! Teaching at Kala Yoga in Orangeville with co-ower Laurin Wolf as receiver. Small class of 10 = a lot of one-on-one instruction! Thai Massage is an ancient bodywork practice which combines acupressure, energy meridian stimulation, and yoga-like stretching, which encourages great relaxation and rejuvenation and provides effective therapeutic relief for many common orthopedic issues. 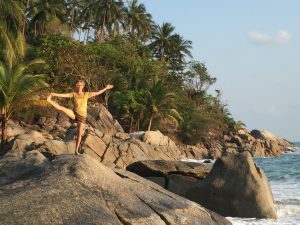 I completed the entire advanced curriculum at The Old Medicine Hospital in Thailand after having completed Level 4 at Thai Massage Toronto and have worked with hundreds of clients since becoming certified in 2010. 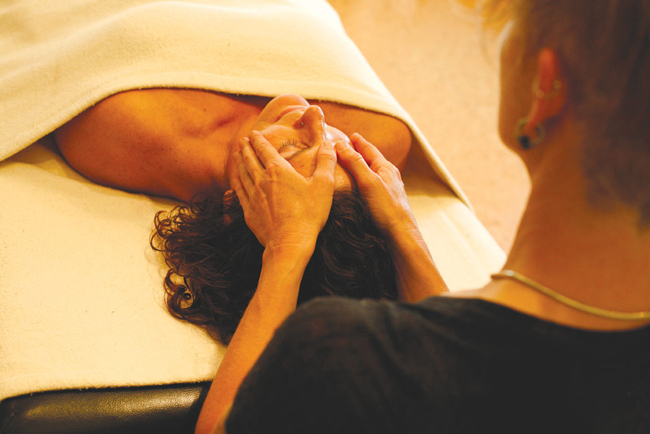 I also do table work as a certified holistic massage practitioner (2008). 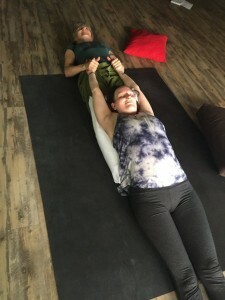 As a practicing yoga teacher at Yogaspace in Toronto and I can suggest ways to incorporate Thai massage into yoga assists for other teachers. Anyone who would like to learn about the theory and techniques of Thai massage is welcome to attend this introductory workshop. 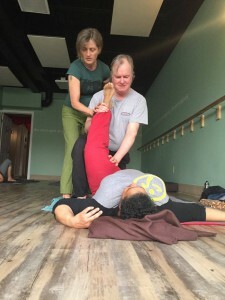 Look forward to bringing the many benefits of Thai massage to friends and family or to learning highly effective new techniques to incorporate into your massage practice. Many Thai massage techniques can be adapted to work on a table. 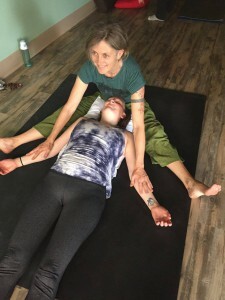 If you just want an introduction to this ancient practice without committing to a full certification training, this is the perfect workshop for you! No bodywork experience is required. Wear comfy clothes such as what you would wear to a yoga class and bring a friend! This is a partner workshop. You can bring a partner or be paired up when you get there. Bring a yoga mat if you have one. There will be mats there for those who don’t have their own. *A maximum of 10 participants will be accepted so pre-registration is required to secure your place in the workshop. There will be no refunds for cancellations within 48 hours of the event. “Jennifer Gillmor’s extensive training, experience and ease in the area of Thai yoga massage was clearly evident in this workshop. 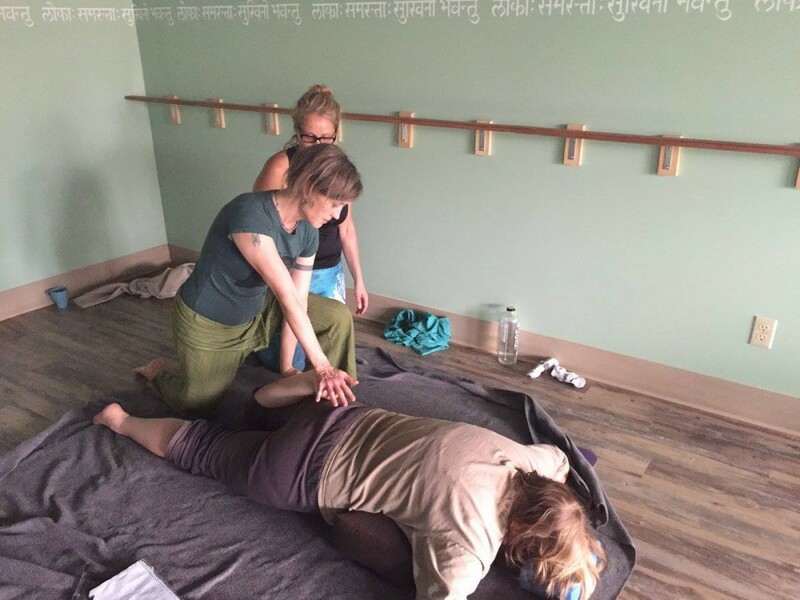 Complete with handouts, hands-on demonstrations, and plenty of opportunities to practice, Jennifer was able to guide her participants in a well organized, logical sequence of Thai massage moves targeting common areas of stress. Jennifer’s personal, light hearted manner and the sensitive attention she was able to give everyone, set everyone at ease and made the whole experience not only safe, but thoroughly enjoyable. ~ Enza Gaumond, high school teacher, yoga instructor, energy worker, participant in the Guelph workshop last year. 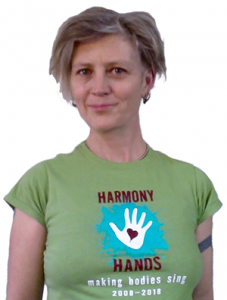 Drop by the Harmony Hands Facebook page for updates. 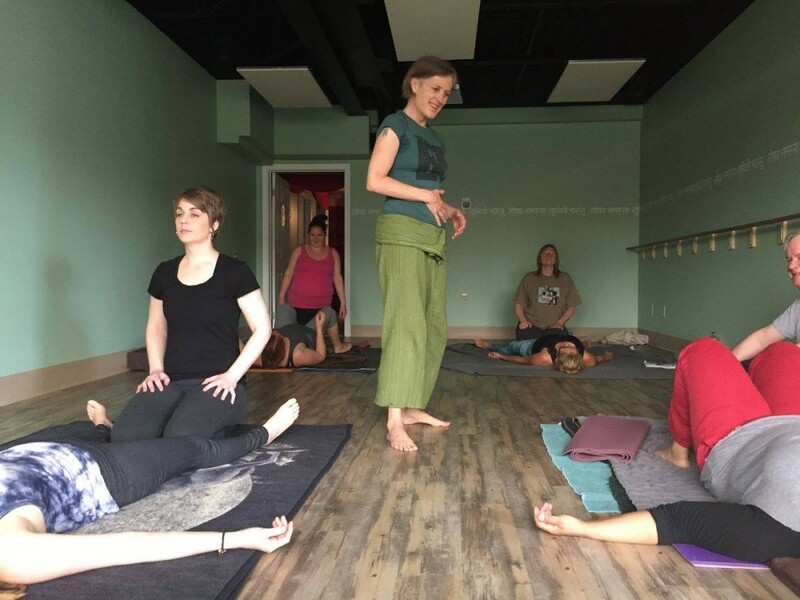 Tuesday morning FLOW YOGA with Jen Gillmor is back! Summer’s been incredible. I hope this was the case for everyone! As we relish the last of its long and warming days, let’s start to recall things we love to do in the fall. I am excited to announce that my weekly Hatha Flow class at Yogaspace has started up again Tuesdays 9:30-10:50am. I teach a very meditative, thorough, stretchy style of yoga. It’s about stress relief, tuning in to your physical, emotional, energetic and mental states, strengthening your body and finding delicious ways to stretch that FEEL GOOD! BONUS: Participants of my yoga class are eligible for a HALF-PRICE massage voucher! A fellow student in my Yogaspace pranayama workshop was complaining of shoulder tension. So I gave an impromptu lesson in this very effective Thai massage technique. Enjoy bringing relief to loved ones who are holding tension in their neck and shoulders. Something new to give them even more reason to love you! I have been using sound elements in my table massages regularly since I began this work in 2008. Many people, once they experience the pleasures of receiving these vibrations during their session, enjoy it so much that they want it to become a regular feature of their massage experience. I generally begin a session using the frame drum pictured at left, producing a gentle heartbeat over the entire length of the back body. I finish either with the pure, cleansing sound of a quartz crystal singing bowl or with the energy infusing, grounding effect of the didgeridoo over the front of the body. Each lasts only a minute or two and I affectionately refer to it as the Sonic Sandwich. I also offer a very special experience for the body and soul which I call Instrumental. After your massage has left you floating in sweet stillness, your spirits are soothed by live cello and flute improvisations intuited to cater to your current emotional state. When things are in harmony, we experience a sense of coherence that is also achieved through certain combinations of sounds, which we perceive as pleasing. However, not all sounds are pleasing: some discordant sounds can be used to break up stagnation in the body, clear energetic blockages and reduce scar tissue. Some practitioners will work with rattles and rums using a staccato beat over the body to break up stagnation in the tissues. The body will also entrain to certain vibrations and rhythms. Entrainment is the natural predisposition for the human body and its physiological processes to respond to and synchronize with both internal and external environments, including sounds and rhythms. One example is the use of rhythmic drumming, which acts as a focus for concentration and breath, and is also used in shamanic work to facilitate altered states of consciousness. Nursing literature describes the principle of entrainment being used with premature twins. One twin was thriving and the other had a weak heart rhythm. Placed in the same incubator, the heart of the ill twin entrained to the heart of the healthy twin. Our bodies have the ability to entrain to certain sounds and to be transformed as a result. … Sound not only prepares the way for manual therapy, but it immediately invites the client into a deeper state of receptivity. While many think of foot massages as just being for relaxation purposes, there are actually numerous other health benefits you can gain by doing them. Not only is reflexology a completely safe and natural way of enhancing your quality of life – it also stimulates nerves, mainly in the palm of your hand and the bottom of your foot. When a specific nerve branch is touched in either of these areas, a different area of the body will be affected. Reflexology is reputed to be able to alleviate headaches, cold symptoms, stress and many other daily inconveniences that we deal with regularly during our lives. Its roots can be traced all the way back to ancient times, and is believed to have originated in Asia. The fact that the practice has maintained a following over the millennia is a testament to how effective it really can be at providing relief and promoting good health. A daily foot massage can do wonders for your mental well-being. A 1999 study conducted at the University of Hertfordshire in the UK found that a five-minute foot massage served to bring relaxation to critical care patients, reducing their stress levels, blood pressure and heart rate. In 2010, a study published in the Journal of Clinical Nursing showed that massage of the soft tissues in the hands and feet comforted those grieving the death of a loved one. Yet another study, this time conducted in 2013 by researchers at Australia’s Griffith University, showed that a 10-minute foot massage significantly reduced stress levels and improved the mood of participants who had a high-stress, demanding job. A 2004 study conducted at the Indiana University School of Nursing found that post-operative patients experienced reduced pain symptoms following a foot or hand massage when compared to patients who just used pain medication. The Applied Nursing Journal published a study in 2010 that indicated that women who received a foot massage after giving birth by C-section reported reduced post-op pain in comparison to the placebo group. Cancer patients were found to experience both reduced pain symptoms and nausea thanks to foot massages, according to a 2000 study conducted by researchers from the University of Canberra. Furthermore, a 2012 study conducted at Michigan State University found that breast cancer patients undergoing treatment reported a dramatic reduction in their physical symptoms, such as lessened shortness of breath and improved energy levels. In addition to cancer, foot massages have also proven to be effective at alleviating the symptoms of multiple sclerosis. In the March/April 2015 edition of the Iranian Journal of Nursing and Midwifery Research, findings of a study conducted by a multi-campus team of Iranian researchers were published, indicating that reflexology was found to provide relief from the crippling fatigue that so many MS sufferers experience. Researchers at Pusan National University in South Korea found that systolic blood pressure, together with triglyceride levels in the blood, both improved dramatically following a therapeutic massage. A similar study conducted in Spain by Dr. Jesus Manzanares found that hypertensive patients receiving massages specifically targeted at reducing blood pressure, in contrast with members of the placebo group, experienced a reduction in symptoms – to such an extent that doses of their high blood pressure medications could be reduced while they were undergoing reflexology-based treatment. A 1993 study conducted at the California Graduate Institute’s Division of Behavioral Medicine and published in the Obstetrics and Gynecology Journal found that women who underwent reflexology treatments reported a marked reduction in their PMS symptoms. Peripheral edemas in the body occur when fluid builds up in a particular area of it. These edemas can be symptomatic of an underlying issue that may require medical attention. Examples of these are kidney disease, heart failure or liver disease. A study conducted in Turkey in 2010 found that pregnancy-related peripheral edemas were significantly reduced thanks to regular foot massages. “What is astonishing is how often clients come to us having completely forgotten or never having known what miracles they are anatomically, physiologically, and psychologically. They have often lost the sense it is an incredible gift to be alive. Thank you to Laurin Wolf and Jason Maraschiello for inviting me to teach an introductory workshop at their beautiful new yoga studio in Orangeville! If you live in the Orangeville area, check Kala Yoga out for yoga, soundwork and wonderful community events. Hey Torontonians! I have taught an Intro to Thai Massage Workshop here in Toronto and am thinking of doing another in the fall. Please comment below if you might be interested and I’ll keep you informed. Teaching Thai massage with co-owner Laurin Wolf as receiver. Teaching a quad and foot stretch. Teaching Dave how to do a great hamstring stretch! Laurin on “the rack” — my toes press her pelvis down to give a delicious stretch to her lower back. Parkdale (Queen & Dufferin), Toronto. Location details upon booking. Home visits: S of Eglinton Avenue to Lake Ontario; W of Broadview; E of Jane Street. I will travel further for an additional fee.